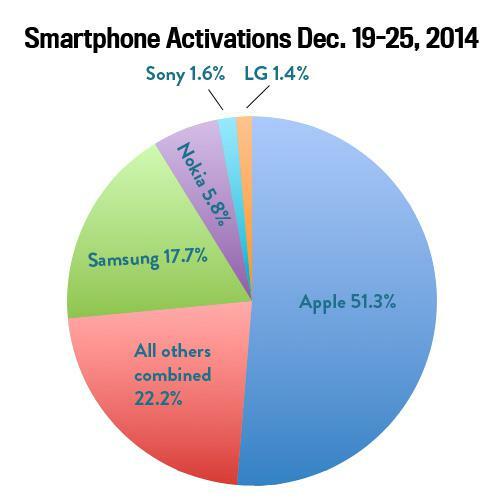 Flurry reports that more than half of smartphones activated over the holidays were iPhones. Half of all activations in the week leading up to Christmas were iPhones. If you think of Android and iOS as the two major competing smartphone operating systems, it might not surprise you that half of new smartphone activations worldwide from Dec. 19 through 25 were iPhones. But if you keep in mind that the iPhone’s worldwide market share is 11.9 percent, it starts to seem significant. The mobile analytics company Flurry, which is owned by Yahoo, published data on Monday about mobile trends during the week leading up to and including Christmas day. The firm found that iPhone and non-iPhone smartphone activations were roughly equal, hinting that iPhones are a disproportionately popular holiday gift. It makes sense, because Android handsets are much more diverse and offer varied combinations of features and price points from all different brands. It’s not impossible, but it is more difficult to pick out an Android phone for someone else. Meanwhile, Apple only sells a few iPhone models at any given time, so gift-givers essentially make choices for recipients based on the price they want to pay. Flurry notes that manufacturers like Xiaomi, Huawei, and HTC—which all make popular handsets—had less than 1 percent of activations each. The firm attributes this to the fact that these brands are popular in countries like China, where the Christmas gift-giving season isn’t as widespread. The report also notes that in December there were 2.5 times as many app downloads as usual, presumably because people were setting up new devices and trying out new apps while they had time off.